On my largest TBR shelf there is a section of emergency time travel books--books that are very fast reads for those times when longer books just aren't going to be finished in time (because, for instance, of trying to finish an impossible number of major tasks ere summer ends). 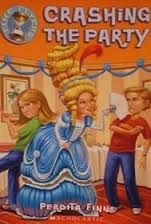 And so, in about 25 minutes, I was able to read Crashing the Party (Time Flyers #4), by Perdita Finn (Scholastic 207, 109 pages, upper elementary/ lower Middle Grade). This was my first Time Flyers book, but I was able to quickly pick up on the pertinent backstory. Josh and Katie are two ordinary American middle schoolers whose family is chosen to host time travelling kids of many lands via the Time Flyers program (the parents don't know about the time travelling, because they are dolts not keen observers). The lasted kid to arrive is a French aristocrat from 1788, and she is not really getting into the spirit of good time travelling visitor--demanding, spoiled French aristocrats are not good houseguests, and they leave white hair powder on your furniture. Basically, she's utterly awful. And she becomes worse when she masters the art of cultural immersion into the circle of It Girls at Katie and Josh's school. I guess the point of the story is that middle school is even worse than it usually is when you have a bitchy French aristocrat who treats you like dirt staying with you and going to your school. Which is certainly a reasonable plot, but its one that, in this case at least, lacks much emotional depth. There were a few brief intimations that there might be depth to the girl's character, but they were too fleeting to have any umph. The story itself is not all that educational--if you had never heard of the French Revolution, that would be one thing to learn, and you would also learn that French aristocrats of that time period had a rather generous sense of entitlement. But this particular French girl is so busy becoming American that her own time is not of interest to her, so we don't hear much about it. There is an Educational Epilogue in which information on life in late 18th century France is shared, but it is so much easier to pick up on information that's embedded in the text that I'm not sure how useful this is. Thanks. Just snorted tea out my nose: "middle school is even worse than it usually is when you have a bitchy French aristocrat who treats you like dirt staying with you and going to your school". Truer words were never spoken!